First Line: See us gathered here, three women stood at Richard Baldwin’s gate. 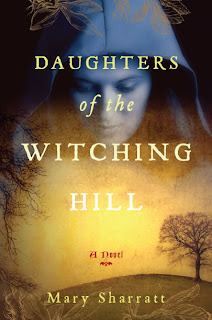 Daughters of the Witching Hill is the true story of the 1612 Pendle Forest, Lancashire, England witch trials that resulted in nine executions. The story opens in the voice of Bess Southern, a poor widow and wise woman who is gifted with visions and the ability to heal. Because she is careful to use her gifts only for good, she earns a strong reputation and the respect of the tiny community she serves. She blesses people and animals, praying over them. Through her spiritual guide, Tibbs, Bess can often predict the future, too. In exchange, she receives food and clothing and other items and is able to support her impoverished family. As the years pass, Bess passes her knowledge and skills on to her granddaughter Alizon and best friend, Anne. As Anne grows desperate to resolve a problem plaguing her family, she uses the skills she learned from Bess for evil, and a life long rivaly ensues between their two families. But it is not until Alizon unwittingly misuses her powers, that terror and suspicion from the villagers draw the women deep into trouble. Accused of witchcraft, numerous people are arrested by a local magistrate to face biased and ambiguous trials. Mary Sharatt draws the reader deep into the story through brilliant dialogue, vivid descriptions, and ever-increasing conflict. Because she lived in Lancashire for seven years, she is able to bring authenticity and believability to this tale. Her storytelling pushes the reader into experiencing the hopelessness of poverty and the direness of circumstances the women face. From forests, to churches, to villages, and dungeons and towers, Mary Sharratt takes us on a unique journey into a time and place familiar to us, but with a unique perspective into the beliefs and myths of the time. There is passion, pain, love, and redemption in this marvelous story of courage and faith. The story will haunt the reader long after the last page is read. And that’s the test of a really, really good book. A pleasure to read. This sounds like a good read, thanks!